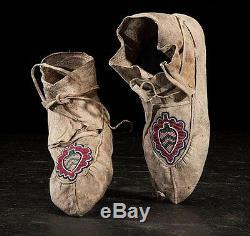 Very rare and very beautiful, ca1880 Pair of Native American Cree Indian Bead Decorated Hide Moccasins. This outstanding Pair of 19th century Cree Moccasins each measure approx. 10 long at their soft sole. The decoration is beautiful - all hand spot stitched and the Moccasins are exceptionally well preserved. These wonderful Cree Indian Moccasins are thread sewn by hand with spot stitched beadwork on the vamp that creates a stylized floral design using pea green, pink, black, light blue, red white-heart, and white beads. The Moccasins feature a front seam construction and retain their original, hide thong ties. The cuffs and tongue are applied. The Moccasins offered here are unconditionally guaranteed original and of the period. They are NOT reproductions or modern recreations but original Cree Moccasins crafted in the second half of the 19th century. The Moccasins come with our no questions asked return privilege and our lifetime guarantee of authenticity. They are guaranteed to be deemed authentic, original and as described by any qualified third party authentication service. These very rare and very beautiful, ca1880 Cree Indian Bead Decorated Moccasins are in excellent condition. All of the hide elements are well preserved and sound with some wear to the soles. The beadwork is very beautiful and without loss or damage. All elements of the Moccasins are original and there has been no repairs or restorations - they are 100% original and 100% beautiful. These Moccasins came to us from a Minnesota Collection. A very rare and beautiful, Pair of ca1880 Native American Cree Indian Bead Decorated Hide Moccasins and a fantastic addition to any collection!! The item "Ca1880 NATIVE AMERICAN CREE INDIAN PAIR OF BEAD DECORATED HIDE MOCCASINS" is in sale since Friday, April 15, 2016. This item is in the category "Collectibles\Cultures & Ethnicities\Native American\ US\1800-1934\Clothing & Moccasins". The seller is "walnutts" and is located in Brewster, Massachusetts. This item can be shipped worldwide.